A silhouette of a bald eagle, perched in a giant Cottonwood tree, against the St. Elias Mountain Range at sunset. 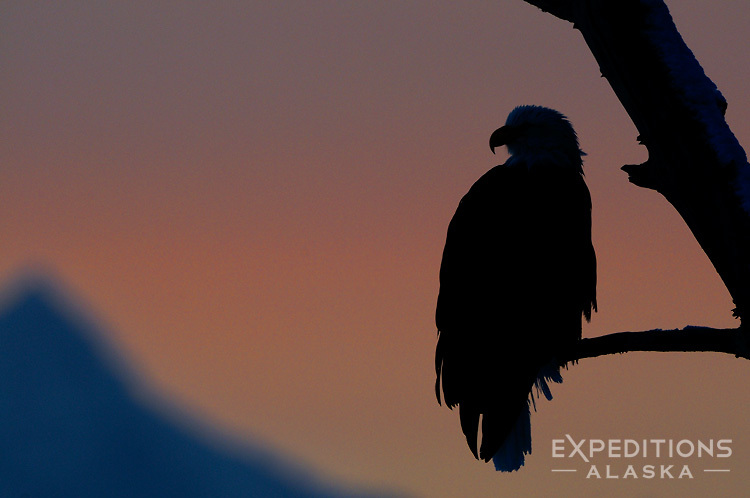 Chilkat Eagle Preserve, Alaska. Please click on the image above to view a larger version of this photo. One of the things I see happen most frequently in the field with groups of photographers is this kind of herd mentality that almost invariably works against the photographer. Particularly when things are not going perfectly. It’s cold, the eagles aren’t doing much, everyone’s been out for a long time, and soon enough, people start talking of packing up, of food and hot drinks, or editing images or watching TV, and before you know it, as the light ebbs, ever so slightly, people pack up and head for home/motel/town. We all know once the light, on a gorgeous clear afternoon, goes down, the photography for the day is over, correct? I think photographers do much better, in general, on their own than in a group. And it’s weird for me to say this, of course, when I take people out in groups to photograph. But I find it’s true. More often than not, I’ll be in a place like the Chilkat Eagle Preserve (outside Haines, Alaska), the light is absolutely killing it, and there might be a sizable number of other photographers in the area. On the afternoon I took this image, there were probably 25 photographers, in various groups and workshops and tours, along the river. Maybe 30 minutes before I shot this photo. When I shot this bald eagle silhouette (above), I was alone, not a Canon camera in sight, only the hushed tones of my nikon clicking away, my breath against the cool evening air, interspersed with the occasional, albeit raucous, calling of bald eagles. Every single other photographer I’d seen, not much earlier, was done for the day and headed for town. I’m not saying this to too my own horn, of course. The image is nothing special (though the experience of being there certainly was). But I think it’s very easy, too easy, to get locked into the herd mentality, the “sheep thing”, when we’re around a bunch of other photographers.And only rarely, very rarely, do I see that kind of group dynamic work in everyone’s favor; most often, it works against creativity, and is counterproductive. I enjoy shooting with a group of friends, and I enjoy being around other photographers at times. I enjoy experiencing the excitement each other feel when we’re out in the mountains, watching the eagles, or the bears, or the aurora or the mountains themselves. But I think we do well to be cognizant of how often that kind of group think thing works against us, and not let the herd take us away from what might happen. Certainly, it’s easy to stay and shoot when the light’s rocking and the eagles are active and cameras firing. But when things aren’t so hot, when it becomes work, and we simply have to wait and wait and watch and wait, the group think can become our nemesis. So stay and watch; wait a little longer, and look for what might yet happen. it may not be happening right now, but it MAY happen. I stayed out and shot this silhouette, then spent about an hour shooting the mountains against the deep night sky and myriad different stars, and even caught a little glimmer of the aurora this particular night. Nothing special, for sure, but well better than sitting in a bar eating a burger. This entry was posted in Adventures, Alaska, Birds, Photo Tours, Wildlife and tagged Bald eagles, Haliaeetus leucocephalus on January 28, 2013 by Carl D.